A few weeks ago, we booked a spur-of-the-moment trip to Niagara Falls. Dustin had some extra hotel points we could use and we had enough airline miles to get us there and back home. Dustin also had a guaranteed week off work. Piper’s been asking to go to Niagara Falls for quite a while now, so we figured why not? Since winter weather can be unpredictable, we agreed to keep the trip a surprise for the kids. We wanted to reserve the right to cancel last minute. We checked the weather in the days leading up to the trip, and all looked great. As the list grew, we replied, “Niagara Falls!” He was excited to say the least. We arrived in Buffalo, New York on Sunday afternoon and made our way to the Canada/US border and then to our hotel. We ventured out that afternoon, in the freezing cold, to witness the splendor of the Falls. I actually didn’t realize Niagara Falls is divided into multiple Falls and there’s a Canadian and American Falls. The original plan was to leave Wednesday evening. That way Dustin could get back to work and the kids could return to school by Thursday, or so we thought. By Tuesday, it became apparent that we were about to experience one of the coldest winter events in years. The polar vortex hit and the temperatures dropped to beyond frigid conditions. This also meant that the entire Buffalo airport, where we were supposed to catch our return flight, was placed under a travel ban and the airport shut down. By the time we got word of our canceled flight, the flights for the next few days had filled up. There we were, stuck in Canada, in a history-making cold event, unable to get a flight home. We were eventually able to find an opening for the last few seats on a Friday night flight from Buffalo to Tampa, which we immediately took. With warmer Florida temps on our minds, via a flight on Friday, we returned back to Buffalo on Thursday (once the travel ban was lifted from the city). That’s when the night of sick children hit. I’ll spare you of the details, given this is a recipe chat (we’ll get to the soup in a minute). Fearing that we would have to cancel our flight, and knowing the next available flight wasn’t until Monday night, I scrambled to find activated charcoal from a drugstore and also called the kids’ pediatrician in Florida. Thankfully, by Friday afternoon, the kids were over their bug or food poisoning or sickness—whatever that was—and we headed to the airport. All that said, I’m grateful to be back in Florida. I now realize that I have no right to complain about any kind of “cold” Florida weather. I have mad respect for all my friends in the north and cold weather climates. You all are amazing! You’re rock stars! The fact that you live through such frigid temps–digging out your car from the snow and spending so much time layering your garments to just venture outside your front door– makes you an all star in my book. 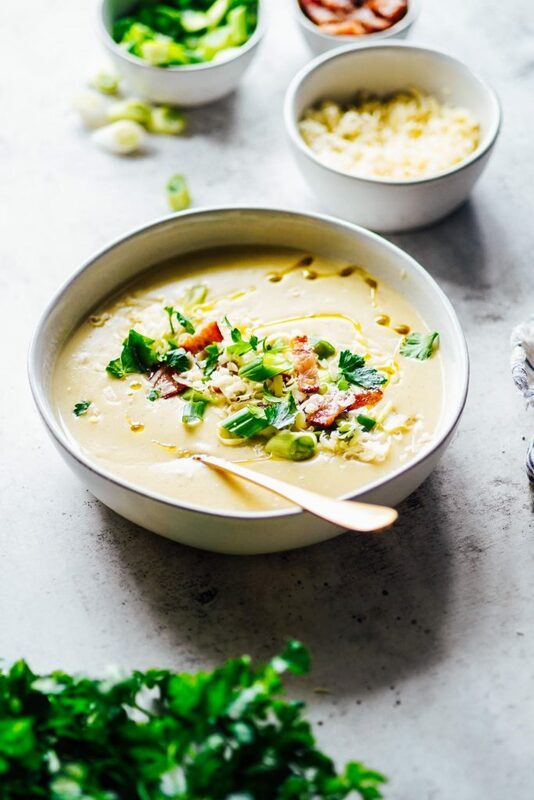 While I can’t ship a palm tree and warm weather your way (although I hear it’s going to warm up soon), I can share a delicious soup to keep you warm. 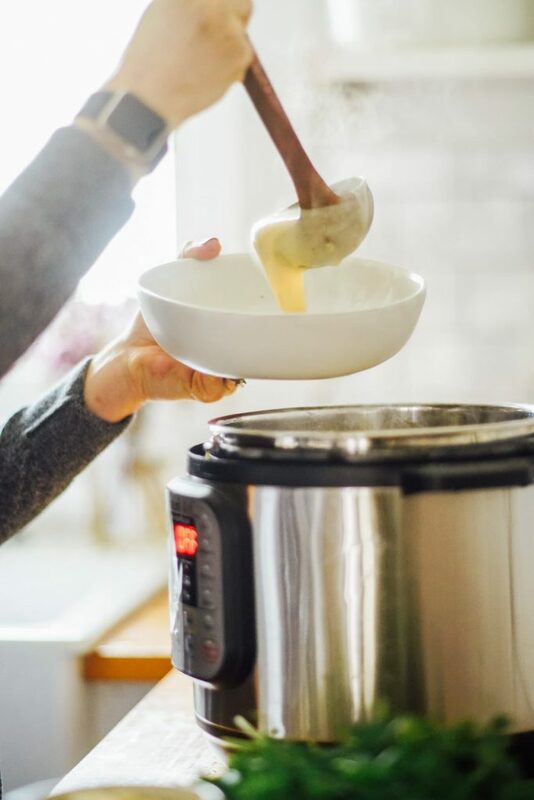 Today’s loaded baked potato style soup is made using the Instant Pot (or the electric pressure cooker of your choice), although you can definitely make this soup on the stove-top. 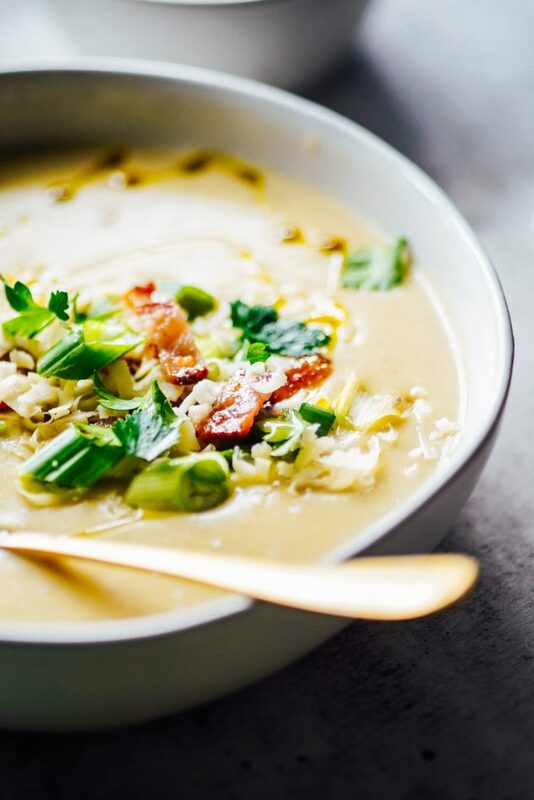 The appeal of making this soup in the Instant Pot is the one-pot, no-fuss nature. Yes, a soup pot on the stove-top is also one-pot, but you’ll need to do a bit more stirring and also regulating of the temperature (bringing the soup to a boil, then a simmer, etc.). 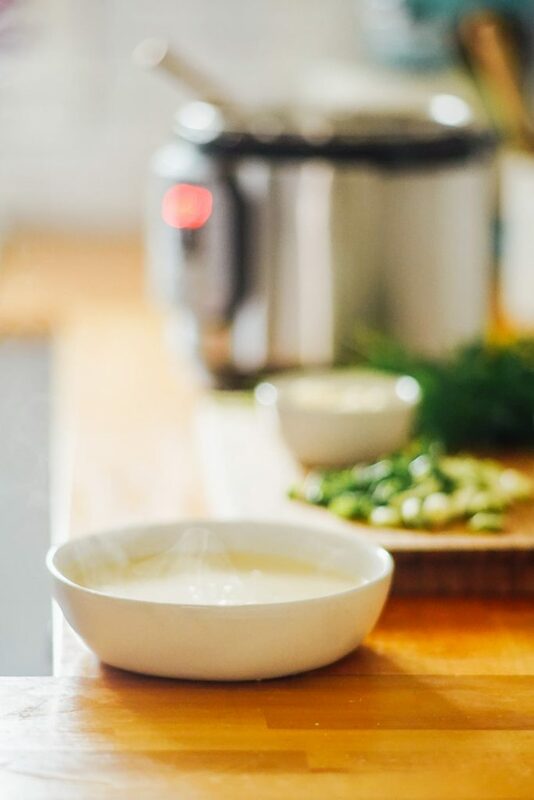 If you go the stove-top route, simply follow the directions provided, but instead of bringing the soup to pressure in the pressure cooker, you’ll want to bring the soup to a boil and then reduce to a simmer. I’m guessing you’ll want to simmer the soup for about 20-30 minutes before the soup is ready to blend. Then add the cream. Of course, I’m biased to the Instant Pot. Soup is one of my favorite foods to make in the electric pressure cooker. 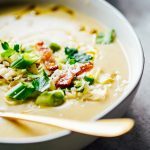 If you’re new to the Instant Pot, I think soup (or eggs or beans) is a great “first food” to make. You’ll notice that dairy is added at the very end of the cooking process. This is for good reason. Dairy and the Instant Pot don’t mix. Dairy can scald in the Instant Pot, when using the pressure cooker setting, causing the Instant Pot to post a burn notice. In this recipe, and most dairy recipes, cream (or whatever the dairy product may be) is added at the end of the cooking process. You can read about all my tips for successfully using the Instant Pot in this post. 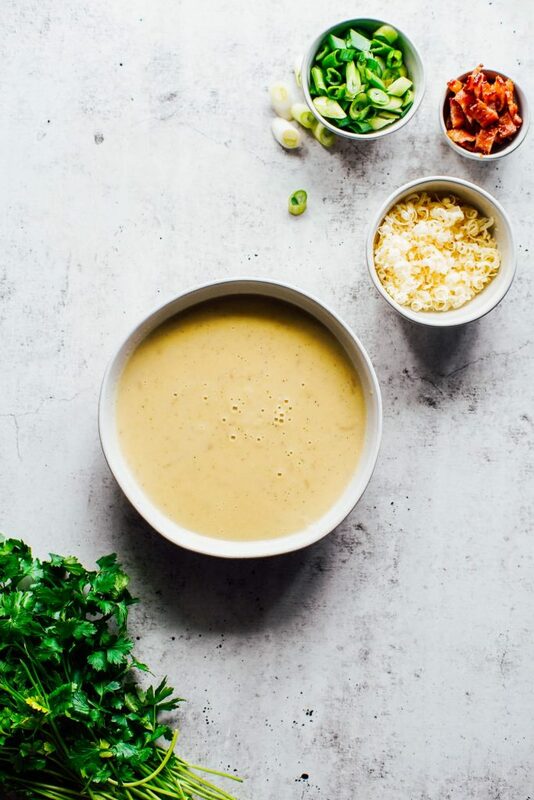 One last note, I’ve added cauliflower to this traditional baked potato soup recipe, because I’m always looking for ways to increase the veggies at mealtime. Since cauliflower currently abounds at the farmers’ market, why not add cauliflower to a soup that’s traditionally just potato based? I promise you won’t notice the cauliflower, once it’s blended up, so even the cauliflower haters (or supposed haters) will ask for seconds. Okay, I think I’ve covered everything. Now, let’s make some soup. 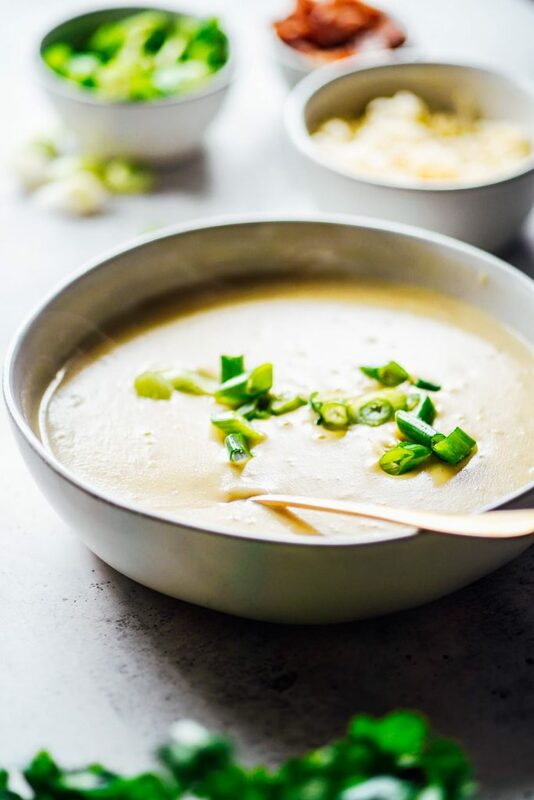 An easy creamed soup made with potatoes, cauliflower, and onions. A flavorful and simple recipe for the Instant Pot or stove-top. 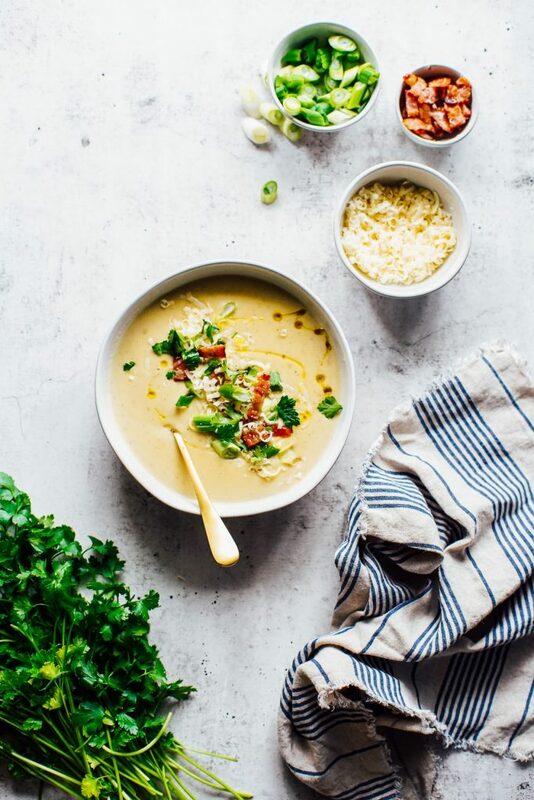 Make the soup for dinner and enjoy the leftovers for lunch throughout the week. Heat the Instant Pot to Saute, Normal. Once hot, add the butter and melt. Add the onions, cauliflower, and potato to the pot and saute until the veggies begin to soften, or about 7 minutes. Stir frequently to avoid burning the veggies on the bottom of the pot. Stir in the garlic and saute for an additional 60 seconds. Press Cancel to turn off the heat and saute mode. Add a small amount of the broth/stock to the pot, making sure to scrape up any brown bits on the bottom of the pot. Add the parsley, salt, pepper, and remaining broth/stock. Secure the lid and set to Sealing. Set to Manual, High Pressure for 10 minutes. Once cooking is complete, perform a careful quick release (use a hot pad holder or towel). If the soup begins to sputter from the valve, close the valve to let it rest before opening again. Use an immersion blender to blend the soup until desired consistency is reached. I like a fully pureed soup. Finally, stir in the cream. 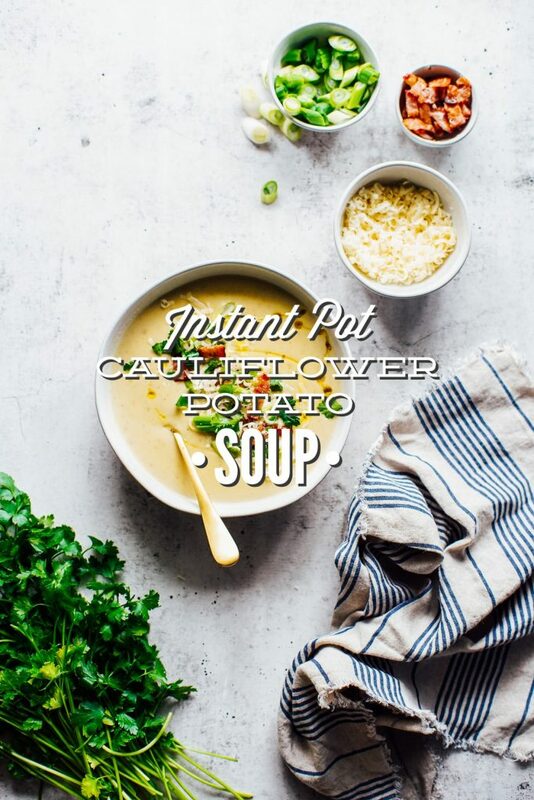 Serve the soup, warm, with any desired toppings (listed above). Store leftover soup in the fridge or freezer for a make-ahead lunch. *If your broth is salted, or you're concerned about the saltiness of the soup (maybe you used salted butter), I recommend trying 1-1.5 teaspoons of salt. Once the soup is blended, and the cream is added, you can taste and add more salt, if desired. I know everyone's desired saltiness varies. As always, it's best to start off small with salt and add more to your desired taste. Salting food to your desired taste preference is always the best cooking practice. I usually add more than 2 teaspoons, once cooked--just a few extra pinches. Again, salting is a very personal preference. You'll know you have enough salt with the soup tastes flavorful and balanced. 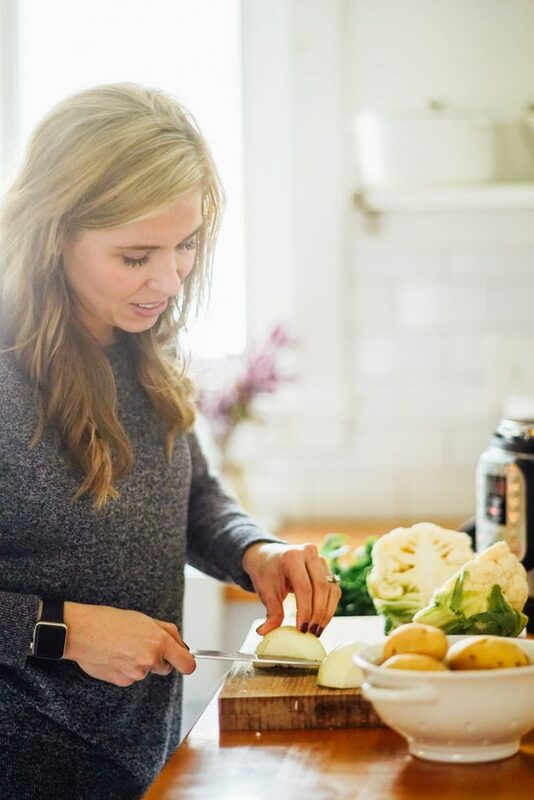 Cook Time: Keep in mind, the cook time will vary depending on how long it takes your Instant Pot to come to pressure. 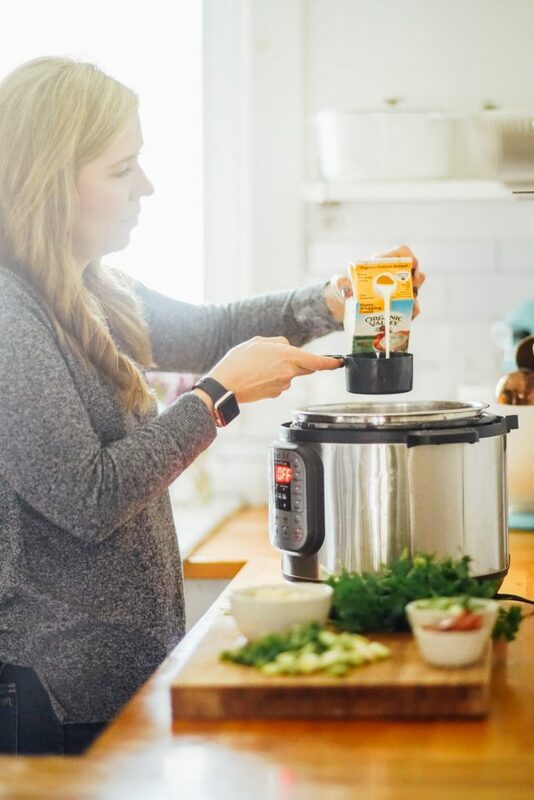 Generally, it will take your Instant Pot about 10 minutes to actually come to pressure before the cooking time begins. 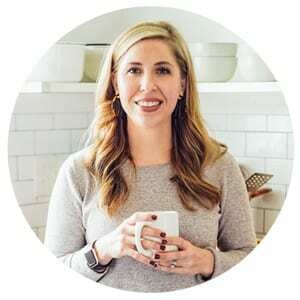 Want to learn more about how to use the Instant Pot? Read my 16 tips. Add Greens: You could add baby spinach to this soup (2-3 cups) before pureeing. This will turn the soup a beautiful green color and also up the veggie count. Can you tell me more about activated charcoal? Do you use it regularly for your kids and/or yourself? What are the benefits? What brand do you use? I am so glad that your kids felt better and you were able to make it back home. Hey Sara, Thank you. We don’t take it regularly, but it’s not to have on hand for food poisoning or a stomach/vomit bug. Then I’ll dissolve a capsule in water for the kids or take a pill. I believe the brand I have is CountryLife–it’s sold at my local health food store. Do you peel the gold potatoes or are the skins ok? Hey Katie, I leave the skins on. 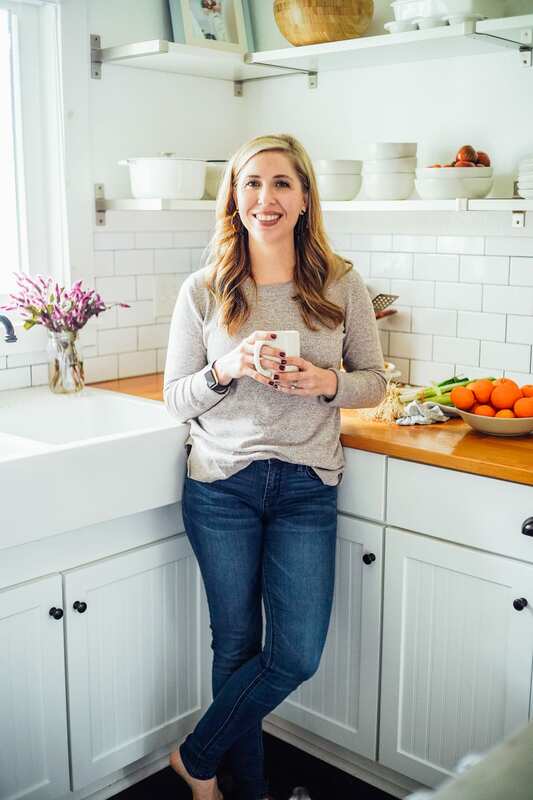 Hey Rachel, Make sure you’re using the jars that say “freezer safe.” Ball specifically labels some of their jars as “freezer-safe” jars on the packaging. Also, leave room for expansion, so leave lots of room on top for the soup to expand as it freezes. Finally, use wide-mouth jars. This allows the soup to expand without any issues. Hope that helps! High five to another great recipe. Loved the extra veg! So glad you loved it, Kara!